What is a girl to do when she is craving Chicken Enchiladas but she doesn’t have the ambition to make them? Why come up with an awesome, easy recipe for Crockpot Chicken Enchilada Casserole, of course! So it is with this recipe! I had been seeing enchiladas in my sleep for days and knew I just had to make some! The issue was I was too lazy to make my Authentic Red Enchilada Sauce for Chicken Enchiladas! So I thought using the slow cooker would be the ticket to get me out of rolling enchiladas! I’m pleased to tell you it was an amazing idea! These taste just like my chicken enchiladas! You can use whatever protein you like. I happened to have leftover chicken, so I used that. You could also use a rottisserie chicken, or raw chicken, if you adjust the cooking time! If you are using already cooked chicken, just add a can of tomato sauce to the crockpot. Add spices. Add diced onion and minced jalapeño. Cook on high about 2 hours until vegetables are tender. Dice chicken. Add the chicken to the sauce in the crockpot and mix. Heat for another 30 minutes to 1 hour, until chicken is heated through. Cut tortillas into bite sized squares. Add tortillas and cook for another 30 minutes, until tortilas have softened. Add cheese and cook for about 15 minutes until cheese is melty. That’s all there is to it! Easy peasy! Serve with shredded lettuce, avocado, sour cream, hot sauce, whatever you like on enchiladas! Add a can of black beans or pinto beans to stretch it even further and add more protein and fiber! Or make them vegetarian by adding the beans, potatoes or cheese. There is evidence of enchiladas being eaten by the Mayans! The Mayans would eat tortillas (actually a Spanish word) rolled around meats, usually fish, according toWiki! Enchiladas were first mentioned in the cookbook, “The Mexican Chef”, in 1831! I hope you enjoyed the recipe today for Crockpot Chicken Enchiladas Casserole! If you give it a try, let me know what you think in the comment section below! Thanks for stopping by today! 2.5 cups cheese, 1.5 cups mixed into casserole, plus 1 cup evenly spread over the top Monterey Jack, Colby, Cheddar, etc. Place tomato sauce and spices in crockpot. Add Onion and jalapeno. Cook on high for approximately 2 hours, until the vegetable are cooked. Add diced chicken, cook for another 30 to 1 hour to heat chicken through. Cut tortillas into bite sized pieces. Add to casserole and mix. Cook another 30 minutes until soft. Mix in cheese and then top with more cheese. Cook until cheese is melted. my family loves enchiladas. This fairly simple crockpot recipe is perfect for my busy schedule! It is very easy! Thanks Krissy! I hope the family enjoys! Perfect for a lazy winter day! My crockpot is my best friend through these months and this looks fanstastic! I love my crockpot too! How did we live without them? It’s hard to remember! Thanks Amy! This is totally genius! My family loves enchiladas! It is so easy! I can’t wait to try this recipe! Thank you Jessica! I’m glad you enjoyed it! Let me know what the family thinks! Most definitely easy enough! I make a baked version of this, but I’m pulling out the slow cooker next time for sure. Looks great, with LOADS of flavor! Thank you Mike! I would love to your baked version, as well! We love enchiladas and have been making them in the slow cooker a lot. So handy! That’s great! They are so easy, aren’t they Dannii? Thanks for the comment! I have been wanting to try more slow cooker recipes like this!! Sometimes you want the flavor of something but you don’t want to take the time to make it! That’s exactly correct! This is so easy! Thanks Anna! Beth- I’m making this before I head out to work tomorrow! Tex-Mex dishes are our favorite! Even better that it goes in the crock pot! Oh, I’m glad! Let me know how your gang likes it! Thanks Nikole! Wow! This looks so delicious and sounds super easy! Always love a good casserole dish, and this one with a Mexican twist looks yummy! Thanks so much Lesli! I appreciate your comment! What a brilliant idea for a tasty slow cooker meal and so easy too! I really need to get my slow cooker out and try this. It is so easy, Corina! I think your gang will enjoy it! Oh wow! I never thought about cutting the tortillas INTO the crockpot! That sounds perfect. 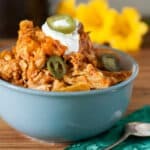 This easy recipe for Crockpot Chicken Enchilada Casserole is right up my alley. I honestly am so busy I don’t know what to do some days. The crockpot has saved me time and time again. I will try this next week for sure! Hi Jeannette! So glad that you enjoyed the recipe! Let me know how you like it! Thanks! Looks so cheesy and comforting. Love that you can make it in the crockpot too! Thanks so much, Amanda! It is quite delicious! Have a great weekend!